An internship is a wonderful way to get acquainted with the industry you’re going to work for after graduation. Should You Pursue Finance Internship? What if You Still Can’t Get Internship? An internship is a short-term position in a company, typically taken to ‘test waters’, as in a student is able to judge his/her suitability in the chosen industry. Internships usually happen in summer vacations or while studying, and each intern is paid a stipend (optional) for their contribution. A 2013 survey by National Association of Colleges and Employers (NACE) shows that graduates with internship experience are valued highly by prospective employers, and their employment rate is higher, of course. This is but a single survey. There’re scores of others proving the same point. As a finance intern, your job profile will be clerical in nature. You have to sit with investment advisors to learn client negotiation, with brokers to learn security selling and order execution, you have to maintain records, do data entry, follow portfolio and audits, handle data maintenance and more. For instance, you’ll be asked to contact customers and update their system data, review current account and share approved information with the customer. Sometimes interns are asked to handle short-term projects. Completing the projects to full satisfaction will reflect nicely on your resume and get you good references. Experience as an intern is invaluable. Stipend is not mandatory. You’re usually paid below Rs. 5,000 for a full-time internship job. However, many companies don’t pay stipend. So, should you avoid these companies? Never! Of course, unless you need financial support desperately, there is no point in leaving unpaid internships. Finance is a competitive field and hence, unpaid internship opportunities are more. Even so, you do get experience and understand if finance is truly for you. These four factors will help a lot. We will see two factors here. Finding finance internships is easy. You can search on job resource sites like LetsIntern.com, Monster.com, Shine.com, Internshala.com and more. Here’s a screenshot from Naukri.com. If you’re looking for the best hands-on experience in Finance through summer internships and internship jobs, here’s your ready “go-to” resource. This is a list of companies hiring finance interns. We aren’t claiming any internship opening at the time of reading this post. You should enquire with them through their business website or job portals like LetsIntern.com and Naukri.com. Bulls & Bears Portfolios Ltd.
DJS Stocks and Shares Ltd.
HGI Finance and Leasing Ltd.
Oriental Industrial Investment Corporation Ltd. This is an incomplete list. You can find the complete and updated list of all companies and corporations working in the banking and the financial services industry here. Bookmark this link, check them out and send your internship profile. Alternatively, view this list of updated and available finance internships for 2015. The 2nd and 3rd points are problem areas. Every job application should include a covering letter unless the advertisement clearly states not to include one. The purpose of a covering letter is to give the employer information about your skills and experience which can’t be explained in resume. If you don’t have that, like in this case, the cover letter acts as an introduction. Check out the cover letter below. You will notice how the applicant shares her knowledge and expresses interest towards working for the organisation. Use it as an example for your cover letter. An interviewer won’t devote more than a minute scanning a resume. You have to make the best impact. Here are two resume samples. 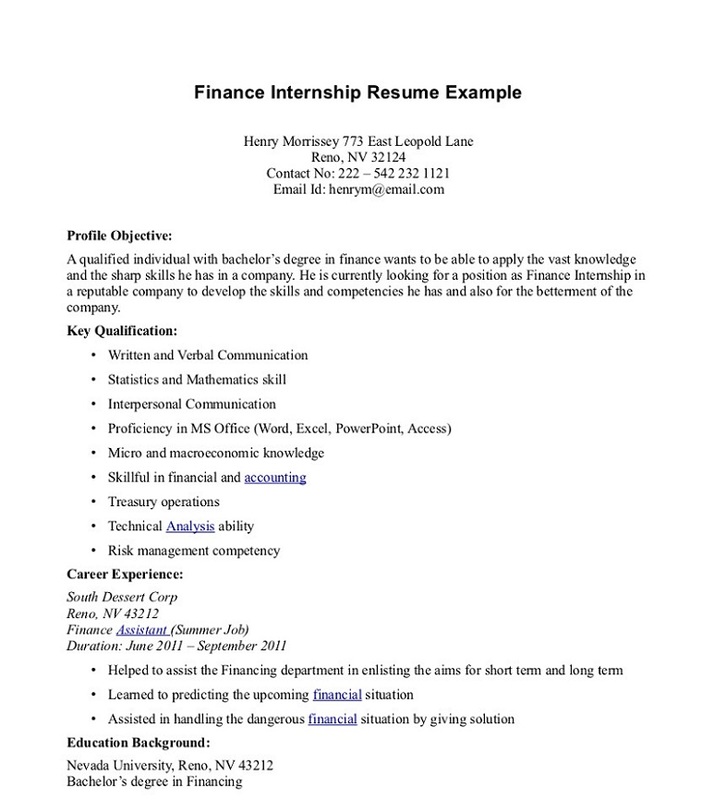 Moving on, here are some resume writing tips to secure finance internship. Lastly, don’t send out the same cover letter to every employer. Tweak it depending on the internship requirements. Finance internship interview questions are tough to crack because most probably, this is the first interview of your life. Consider yourself lucky if shortlisted for interview. Here are some questions to expect your way and some tips to answer them. Why shouldn't I hire you? Who is the person you admire and why? Here is a pen – convince me to buy it. What do you know of the finance industry? Why do you want to join the finance industry? Why are you a ‘fit’ for this company? Will a new company go for debt or IPO? Mirror practice these questions. Perhaps you’re expecting answers to these questions but no one can offer that. You have to create your own. Whatever you say, just make sure you don’t babble and deviate from the question. If you notice, these questions have nothing to do about finance or your finance skills because they know that you lack experience. What the interviewer will try to assess is your personality and character, your common sense and logical skills. Be prepared very well and dress your best! Not only in India, try to seek an internship position abroad too. Since you won’t be visiting the foreign lands, all communication will be done through emails. Start at least 6 months in advance – searching, short-listing companies and concerned person contact email – and keep track of openings. Don’t get disheartened with not finding the ‘right’ internship opportunity or not at all. Internship isn’t mandatory to get a finance job yet! We hope the guide will help you in getting the right internship opening. I am Pursing my MBA First year now, i am willing to do summer intern now. I have basic knowledge in Finance. Could you please suggest me how to approach for summer internship. Please read this guide word-by-word. Let’s discuss this on WhatsApp: 9422038561.
i am currently on my MBA internship at a financial services company. My internship profile is an equity researcher. Could you please suggest what all skills to learn at the internship so that it helps in placements? I will be completing my MBA (PGDM finance). Unfortunately due to my college location, I’m unable to get a job other than the South zone. Also this year, the finance openings have been very slim. Most companies and banks have come for marketing and sales roles. I am a fresher and have done my summers from L&T Infra Finance, Mumbai. I’m keen to get into the corporate credit sector in the long term. However, I have observed that most credit rating agencies and banks require minimum 1 year relevant experience from candidates. And NBFCs don’t usually hire from campuses. Now, how do I get this relevant experience is a big question; as I am a fresher. Sometimes if you have relevant practical skills, these companies may take you even if you’re a fresher. You can apply to the companies mentioned in the post above. Thank you sir for the insights into the role of a finance internship. I have a question, I’m a fresher pursuing my MBA and I’v taken my majors as finance. With this choice of mine, I’v been placed under a Financial consultancy firm which is a start up . What possibly can I do in a start up ? where I can initiate an activity. Awesome and endless opportunities to grow in a startup. Take this job and stay there for 2-3 years at least. You will learn a lot that you can’t learn in a big company in 5-6 years. thank you sir, for which profile should i apply for internship as i will be learning about finance from scratch ? ok thank you … will clearing CFA level 1 increase my chances of getting admitted into better colleges for masters course in financial engineering in US ? Yes. If possible have 1-2 years experience too. to get a entry level job in finance industry in Pune so that I can gain practical insight of finance subject. I am good at academics. How and in which company should I apply. And also tell me about how to prepare for selection process. Please guide me. Please read this and this article to clear your queries. Will passing CFA level I with only graduation get a good internship? Sir is it also possible to start preparing for frm or caia after CFA level 1? Would it be advantageous in a search for an internship? Sir , are there internship opportunities available after passing CFA level I? You need to search that. ‘Is it a good idea to to work under XL Dynamics? I have heard their attrition rate is high. Not that I bother much because I am ready to work . Is it a good platform for growth? I want to see myself earning near to 1 lakh per month by end of 8 years . Considering my aptitude is good and I am a Quick learner. Is it learn while you earn program? What’s the job profile and salary during these 2 years? Yes it is a learn and earn program. I want to know what my exit opportunities will be after being 2 years in this company i.e completing my weekend MBA, as it is a mortgage company. Will I have plenty of opportunities? If your work is primarily into Mortgage, and you want to move to other financial KPOs in equity research and investment banking, you may need to acquire skills required to perform such jobs. hii sir, I’ve read your post and it is very good but very few of these companies seem to offer internship opportunities in delhi. Also i haven’t found any company offering internship to students that don’t belong to ivy league colleges. i am in third year of b.com and last year also i searched for companies but never found anyone. if you guide me through this it would be very helpful. Did you check company’s eligibility criteria for internships? I am currently working in a broking firm, basically am a intern now. Here I am learning arbitrage trading. I am preparing for CFA and will take up financial modeling course also. I want to know what are the prospectives in India of getting into financial research analysis specially equity research with cfa and after knowing financial modeling??? After CFA and Financial Modeling course, you’ll have excellent prospects in India in Equity Research and Portfolio Management roles. Please read this article for the use of financial modeling and this for CFA. Moreover, you can make a career in equity research without going for CFA. Check our 6-week program for this.